There are 168 Assisted Living Facilities in the Danville area, with 12 in Danville and 156 nearby. The average cost of assisted living in Danville is $3,990 per month. This is higher than the national median of $3,346. Cheaper nearby regions include San Ramon with an average starting cost of $3,695. To help you with your search, browse the 572 reviews below for assisted living facilities in Danville. On average, consumers rate assisted living in Danville 4.0 out of 5 stars. Better rated regions include San Ramon with an average rating of 4.2 out of 5 stars. Caring.com has helped thousands of families find high-quality senior care. To speak with one of our Family Advisors about assisted living options and costs in Danville, call (855) 863-8283. The Town of Danville is a northern suburb of San Ramon, California, located just 30 miles east of San Francisco. Danville boasts a quaint, home-town community with historical roots that include Nobel Prize winning playwright Eugene O'Neill. Danville is also the site of 12 licensed assisted living communities. 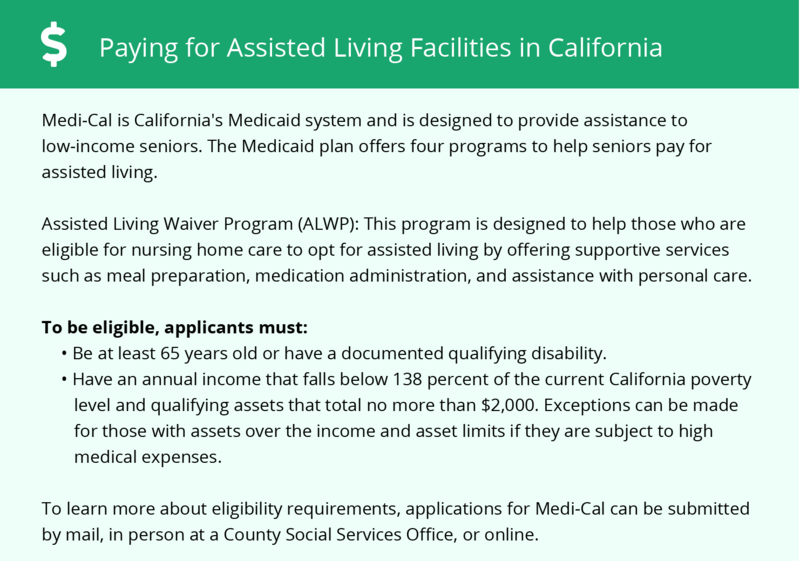 These communities are registered, along with the much smaller residential care homes, through California's Senior Care Licensing Program, a division of the Department of Social Services. Residents in these communities enjoy a generally high quality of room and board, supervised care and personal help with activities of daily living, such as bathing and personal care. Danville is perched on the reverse slope of the Oakland hills, in the same climate zone as nearby Walnut Creek, so it stays warmer than the standard breezy cool of the Bay Flats areas. In the minor rain shadow behind the Caldecott Tunnel, daily highs average 69 degrees Fahrenheit, lows stay near 48 degrees, and 25 inches of rainfall each year. Contra Costa County has very poor air quality, according to a 2018 report by the American Lung Association, which placed the Danville area as the nation's sixth-worst in ozone and overall pollution. This is partly a result of the hilly terrain trapping smog, and partly due to heavy traffic on the local roads. The same report notes that air quality has dramatically improved since the turn of the century, suggesting greater improvements to come. The cost of living in Danville is 98 percent higher across the board than the average elsewhere in America. Most of that difference is housing costs, but transportation is 30 percent more expensive in Danville, and groceries 25 percent higher than average for the nation. Crime is really low in Danville, at least in most categories. Assault, burglary, larceny and most violent crimes in this community of 45,000 people are generally below 20 percent of national averages. Bay Area Rapid Transit (BART) has a major hub in Walnut Creek, and an extension runs through Danville to San Ramon. Seniors can ride on the BART buses and trains at a discount, and the routes stretch across the Bay Area, connecting communities separated by dozens of miles. Danville is a short hop down Interstate 680 from Walnut Creek, where two world-class medical centers treat inpatient and emergency cases. John Muir Memorial Medical Center and Kaiser Permanente Walnut Creek both maintain several outpatient clinics in Danville, in addition to the main campus sites a few miles north. Assisted Living costs in Danville start around $3,990 per month on average, while the nationwide average cost of assisted living is $4,000 per month, according to the latest figures from Genworth’s Cost of Care Survey. It’s important to note that assisted living rates in Danville and the surrounding suburbs can vary widely based on factors such as location, the level of care needed, apartment size and the types of amenities offered at each community. 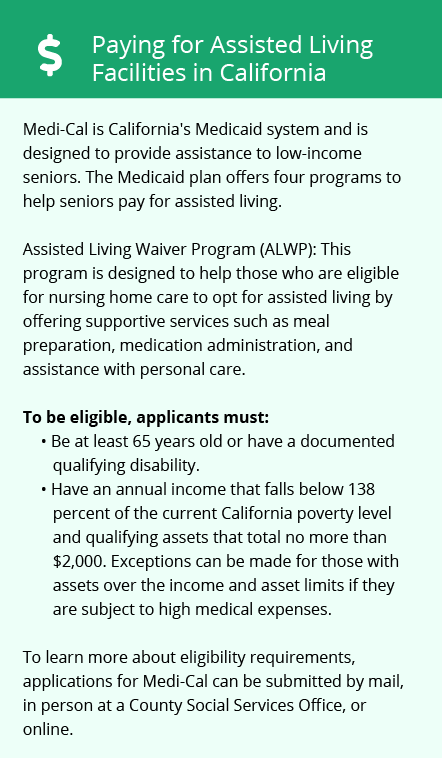 California's Assisted Living Waiver program can pick up much of the cost of assisted living for qualified seniors. To see a list of free assisted living resources in Danville, please visit our Assisted Living in California page. Danville-area assisted living communities must adhere to the comprehensive set of state laws and regulations that all assisted living communities in California are required to follow. Visit our Assisted Living in California page for more information about these laws.